In need of Halloween costume ideas? Are you obsessed with Snapchat filters? Well, this makeup artist has combined makeup with Snapchat for real-life works of art and it’s just the costume inspiration you’ve been looking for. Vlogger Rachel Levin, posted a DIY beauty tutorial on her YouTube channel focused on three different Snapchat filter looks and we’re still in awe. 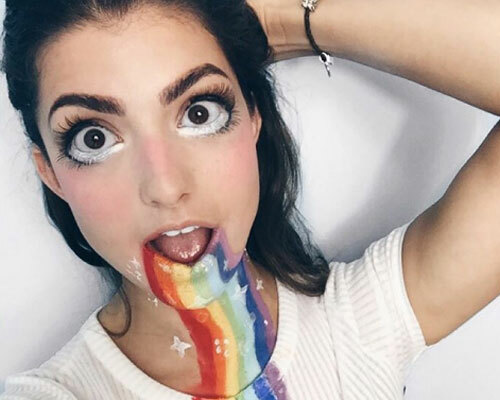 The young beauty guru, showed off her rainbow river mouth look, the crying eyes filter and one of the creepy face filters through an easy how-to video that you can recreate this Halloween or anytime you get bored. Her rainbow vomit DIY requires lots of colors, which Levin suggests using face paints for and a paint brush. To achieve the glitter part, all you need is white face paint. It’s so simple. For the crying face filter, Levin uses more face paint (white) and adds grey shadow and paint around the eyes. To create the pouty lips portion she suggests over-drawing your lower lip and using concealer on the top lip for a thinner lip area. Lastly, Levin does the creepy monster filter and reveals it should look sloppy. You need grey face paint, which can be achieved by mixing the black and white colors. The most important part is the teeth on this look, so pay attention closely during this segment. Look at the video below for the step-by-step tutorial of all three filter looks. They are so cool! If these filter beauty tips aren’t enough Snapchat fun for you, beauty artist, Emily Morris, recreated the puppy dog filter in a quick video that even the most amateur makeup fan can do. After applying the makeup all you have to do is stick out your tongue and people will think you’re actually a filter! Which filter would you want to recreate IRL?